Gamification is the process of applying game mechanics and game design techniques in non-gaming contexts to engage and motivate users to achieve certain goals. Gamification leverages interactive game design and taps into people’s basic desires for achievement to create the optimal context for behaviour change and successful outcomes. In gamification, the learning process turns into a game and points, levels, rewards, achievement badges and feedback loops are some of the key elements used in gamification. 1.Providing better learning environment and better learning experience. Gamification uses informal learning environment to help users to practice real-life situations and challenges in a safe environment. The learners experience “fun” and receive instant feedback during the game to obtain associated knowledge. Gamification holds learners’ attention and motivates them, encouraging them to reach a goal. Learners are rewarded for their efforts and change from passive observers into active participants. 3.Making Learning fun and interactive. Interactive elements of gamification create the feeling of immersion, making learning not only informative, but fun and exciting too. Gamification can drive strong behavioural change with the persuasive architecture of meaningful rewards. 5.Improving knowledge absorption and retention. Gamification can stimulate learners’ interests and foster a motivational emotional connection between users and content. This will help users to create memorable associations of the subjects and allow their brains to retain the knowledge for much longer. Mobile has exploded in such a way that it has become an integral part of everyday life for many of us. Anytime anywhere mobile learning can dramatically improve teaching and learning and bring more inclusive and higher quality education to students. Adding gamification to mobile learning creates a powerful strategy that combines engagement with convenience, providing a portable gamification experience for effective learning. 1.Careful Calibration. Instructional designer should carefully align gamification with the educational needs and learning goals. 2.Accessibility. Educators must keep the game mechanics and structure easy to understand and follow and offer equal access for all the learners. 3.Builds Confidence. Good mobile games keep simple rules and help students gain confidence as they have a winning learning experience. 4.Enhances Intrinsic Motivation. With continuous feedback and rewards, mobile games can engages and motivates students with a sense of accomplishment. 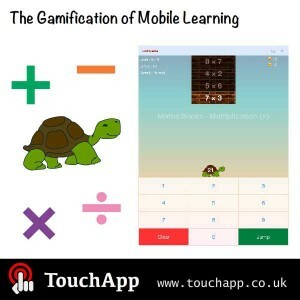 An example of good mobile game design for Math learning is the popular app series of Maths Bricks. These mobile math games use a cute tortoise to help you break math operation challenges. As you practice arithmetic, you will have a cute tortoise jumping up to break the Maths Bricks for you. It offers a fantastic way to improve or refresh you mathematical skills and you will have a lot of fun doing it!